Last week I read a story about six-year-old twins who racked up bill of $1600 of in-app purchases, and I also heard that a search in an Android store for “Education” apps yielded a result for female masturbation. It’s not just happening to others, and as my son gets older and starts recognising letters more, I’m worried about the kind of content he’ll come across on our devices. So, I gave myself a little Apple iOS education in parental settings that aim to protect kids from explicit content (and save your wallet too). It’s good to note here too that unlike with other systems, all app content has to be submitted to and approved by Apple before being available on the iTunes App Store, which means you want get any viruses or highly explicit content. Type your administrator password in the resulting dialog, then click OK (You’ll need to know the administrator’s account name and password). 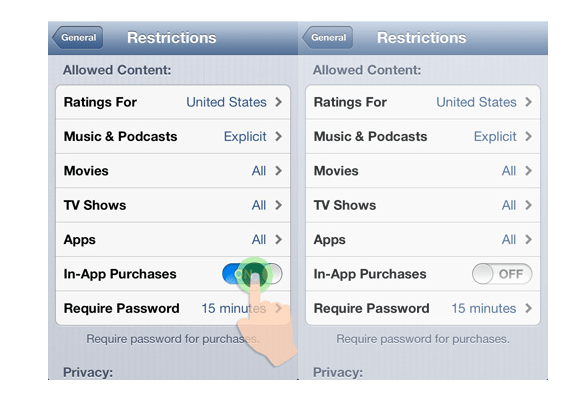 If you want to make changes to your restrictions, open iTunes preferences, click the Parental tab, click the lock icon, and enter your administrator password in the resulting dialog to unlock the parental controls. You can then make any wanted changes. Here’s a step-by-step, via iTunes. Tap on Settings > General > Restrictions. If this is your first time using restrictions feature, tap on Enable Restrictions. Scroll down until you see the ‘Allowed Content’ section. Under ‘In-App Purchases’ toggle it OFF.